Q From Ana Alfaro in Panama: I have come across the term palooka as in ‘they are a couple of palookas’ and in Palookaville. Could you explain what it means? A The word has two main senses, both principally American. One refers to an unsuccessful boxer, especially one who is both large and stupid, the other to any large and stupid or clumsy person, an oaf or lout. Many older people first came across the word as the name of the boxer in Ham Fisher’s famous comic strip. This is variously stated as having begun in 1928 or 1930, though the truth seems to be that it was briefly syndicated in the earlier year but then disappeared for a while, only becoming widely available two years later. 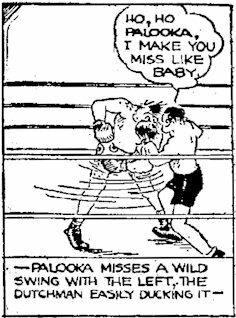 The strip featured the eponymous Joe Palooka as a slow-witted and inarticulate boxer, even though “his heart was pure and his ideals high”. But Ham Fisher didn’t invent the word: it had been around for several years by the time his strip first appeared. (The earliest I can find is in the Lincoln Star, Nebraska, in March 1923: “But [Jack] Dempsey against some palooka who had been press agented into greatness and into the form of a Dempsey menace — that would pack any outdoor arena.” The casual reference shows that it was even then familiar to the writer and that he expected his readers to know it.) The boxing associations seem to have been particularly strong, to judge from the magazine The Ring, which in November 1926 glossed the word to mean “A tenth rater, a boxer without ability, a nobody” and which implied it had been known for some time. It’s often said — following the statement by H L Mencken in the 1945 supplement to his work The American Language, which in turn echoes the belief of a writer in Esquire in September 1936 — that palooka was the invention of Jack Conway, the editor of Variety magazine in the 1920s who was largely responsible for developing the magazine’s weird style; he is credited by Mencken with creating a whole group of slang terms that include pushover and baloney. Whether he actually invented palooka, or popularised it, we have no way of knowing, nor do we have any firm idea what it was based on. However, it has been suggested that it is based on the Polish surname Paluka and might be a variation on dumb Polack, a relatively mild racial slur of the period. Several of Joe Palooka’s adventures were made into films, and Palookaville came to be a slang term for a hick town full of gentle losers. Last modified: 24 May 2005.